I've joined another swap ... yes, I can hear you gasp ! but I couldn't resist this one - its being run by my friend Nicky from Mrs Sew and Sow and its her first swap ... Nicky is also being assisted by the lovely Helen from Archie the Wonderdog and of course I suspect Archie will be lending a paw as well (wonder if he's been promised lots of extra biscuits) ! The swap is for purses made with little frames and I've wanted to do one of these for quite a while ... I figure joining a swap is a great way to get these little to-do projects done! 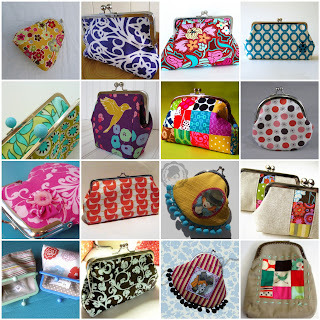 Those little purses look like so much fun! Wish I had time to join a swap, but I just don't, I will enjoy seeing what you do with it, though! I made one of these about 15 years ago, to go with my daughter's prom dress. I was surprised at how easily it went together. I think it's a hoot that these are now faddish. I guess I'm showing my age when I say that I'm seeing lots of stuff come around that was done years ago. Enjoy making them! I hope you enjoy it - you should have your partner details waiting in your inbox! !